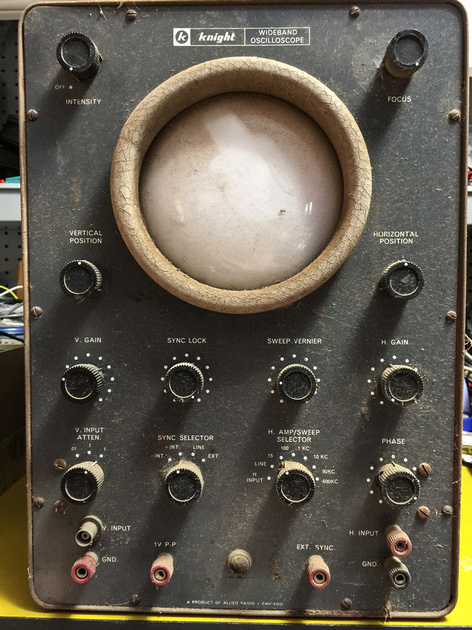 I have a Knight Wideband Oscilloscope that I'm thinking about restoring after I get through with a couple of AA5's. Here's a photo of my little piggy awaiting her new lipstick. I'm kind of worried about needing to replace the bezel around the CRT. It's not in very good shape. If there's a way to stabilize it maybe I could save it. Oink. The first thing I would do is check the power transformer, probably by pulling the tubes and then running it for a week or two in series with a small lamp (in case it shorts). Cool beans. I can set it somewhere out of the way, like a non-flammable area , and see what happens. If the light is still on in 2 weeks I can start the process. I have a 6kV probe, a much needed and now always used isolation transformer... I need a schematic... but to get that I need a model number. Maybe it's on the inside? Last edited by Mike6158 on Mar Sat 28, 2015 1:13 am, edited 1 time in total. Early 60s Knight-Kit. It is often very difficult to find documentation on Allied Radio Knight-Kit equipment. Thanks for the catalog link. I haven't had much luck with finding a schematic but I haven't looked that much either. I undressed Miss Piggy and got her ready for electricity. I'll power her up tomorrow. I think I've narrowed it down to a KG-630. I had to buy a manual but sometimes thats how it goes. Either the graticules have been "cleaned off" of the 5UP1 CRT or they didn't exist to begin with. It's not going to be much use but it might be nice to see it light up some day. It sure has a lot of paper electrolytic caps in it. And there are (2) .1µF 1600V caps on the supply. 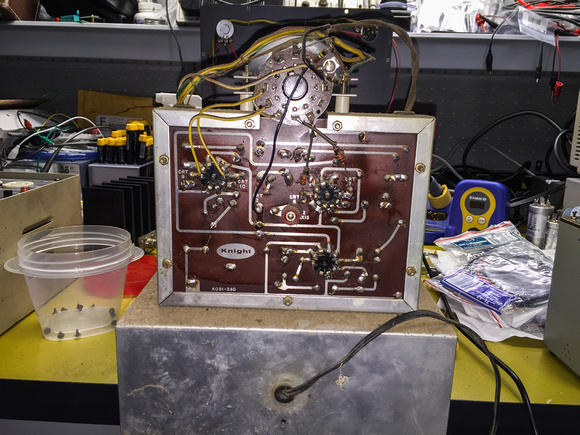 The Knight Wide-Band Oscilloscope kit early on was identified by its catalog number. It appeared as a 38K167, 83YZ-144, 83YU144, and a totally redesigned front panel as the KG-630. Schematics for all four, although I didn't check part for part, look identical. Picture wise, from what you posted, the 83YU144 is what you have. The Knight marking above the CRT is also identical to the 83YU144. Well shoot... I saw a KG-630 (so the seller called it) on eBay and the picture looked like mine. As long as the schematic isn't different I guess it doesn't matter. I didn't verify part for part nor wire for wire that they were identical. Even though all the controls are roughly in the same location as yours, that's not a proof that both units internally are identical. I don't think the 5UP1 had a graticule. It was probably a printed piece of clear plastic that fit in front of it. I didn't think of that Jim. Either way... it'll be fun to play with some day. There are some interesting electrolytic caps in this oscilloscope. There are two 2 section 20/20 150MVDC caps, located in different areas of the scope, that are wired as each was 1. In parallel in other words. So they could have used a 40µF 150MVDC. I guess 40µF 150MVDV caps were expensive or not readily available back then. I'm not sure what MVDC is supposed to mean. At first I thought I had seen WVDC but I triple checked, it's an M. The caps are relatively small, paper electrolytics. Maybe 3/4" diameter. The rest are pretty standard. The 5UP1 doesn't have a graticule. If this is going to be of any real use you need to replace that 5UP1 CRT which has a rounded face with either of these. All have a flat face. Depending on what you will use this scope for a graticule may not be needed. If you do need a graticule you could post in the classifieds and see if anyone has one for a 5" scope CRT. 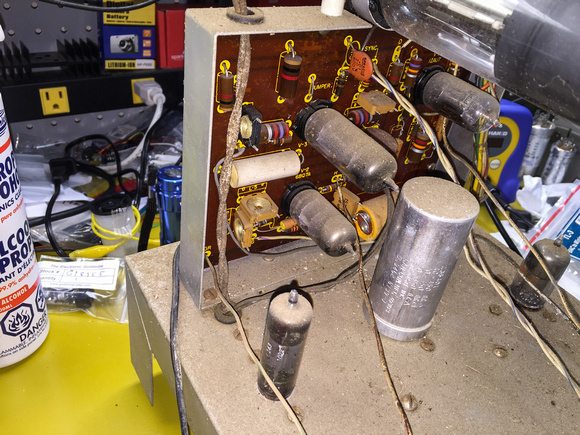 I find that I use my vintage scopes for tube audio amp work where I just need to verify a waveform is present and looks like it should and don't want to risk damage to my good solid state scope. For that I find a graticule isn't really needed. I need to see if it works before I figure out what to do with it. I have a couple of Tektronix scopes. I just wanted to see this one live again. The transformer test went well so I ordered caps. Hopefully I can bring the light back into Miss Piggy's eyes. I gave her a waterless bath but she needs more attention. I did that with a solid state Heathkit oscope and it worked very well. If so desired the clock can be mounted inside the scope, but for that particular scope it may not be easy if you wanted to use the serial port of the clock board. 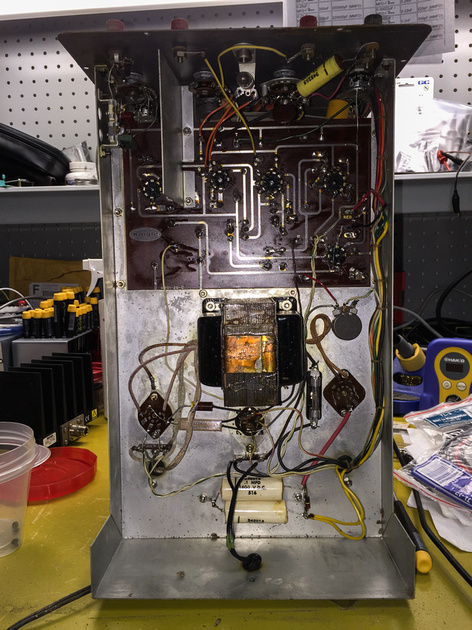 The main thing is how good the vertical and horizontal amplifiers are which determine how good the clock will look on the CRT. Also how the scope is coupled (AC or DC) will determine how good the clock displays. Winter/spring 1985 I had a work-study job at a mental heath care facility in the town I was attending Electronics Tech classes in. There was a repair shop of sorts in the basement of one of the buildings on the campus. My job for a couple months after classes was working in the shop fixing stuff that was sent down there. 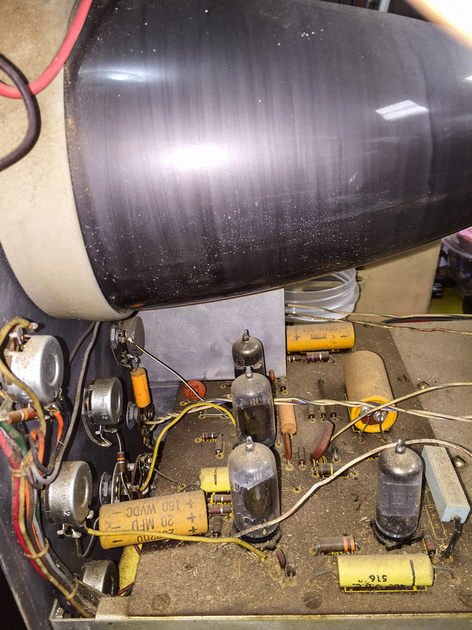 Mostly TVs with blown HO transistors and phonographs. There was a Knight scope very much like this one on the bench. What I remember about it was it wasn't much of a scope as compared to the 70s era Tek, HP. and Phillips scopes at school in the lab. No triggered sweep. The timebase nor the vertical were calibrated. The sweep was not linear and there was a noticeable cramping of any waveform on the right side. I recall going through the manual I found and doing a "cal" on it but it was the same as before. The CRT had a domed/round face and there was a green tinted plastic sheet in front of it with a gratical printed on it. Not sure why they bothered. It was useful to see if there was some sort of waveform present as compared to a dead circuit though so I could imagine it had some use. That little shop had some neat stuff in there from back in the days like a pretty nice B&K tube tester and a few other items. No doubt it with all the NOS parts and stuff went to the dumpster long ago when the mental hospital was closed down over 20yrs ago. More than likely that scope may have had some failing parts which would cause the problem you noticed.